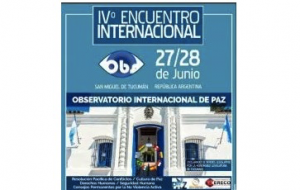 The IV International Meeting of the OIP (International Peace Observatory) will be held in Tucumán, Argentina. It is being organized by the CERECO Foundation (Center for Conflict Resolution) in conjunction with the CPNVA (Permanent Councils for Active Nonviolence). The Meeting will be held on June 27 and 28 in the facilities of the Faculty of Law and Social Sciences of the National University of Tucumán, a co-organizer of the event. The meeting has the support of the Consultative Council of the Civil Society and the Argentine , Ministry of Foreign and Religious Affairs. Mariela Domenichelli, the president of CERECO, and Ricardo Anibal Lucero, a participant in the event, explained to El Siglo that the meeting aims to open the doors of dialogue, strengthen relations between social actors from different countries with different profiles and histories so that they can share experiences and find ways of working together for a more just, united world. The meeting will make available to governments and civil society the updated state of the art in training methods for conflict prevention and resolution, as well as face-to-face and virtual training for violence prevention. – Patricia Pérez (Buenos Aires) Coordinator of the Committee on Culture of Peace and Citizenship of the Consultative Council of the Civil Society of the Argentine Chancellery;. – Commissioner Jorge Martin Ortega and Dr. Daniel Arnaldo Tolaba (Jujuy, Argentina), community mediators and specialists in gender violence and in suicide prevention. Ministry of Security. Secretariat of Community Relations, Government of Jujuy. Registration is available on the website of eventowww.cerecotucuman.wixsite.com/observatoriodepaz, along with further information for the meeting. You may also write to programa.obspaz@gmail.com.